NEW Customers. Enter your scratch-off code. Don't have a scratch-off code? Purchase the online only version of RadCases. If you already have a RadCases online account, please Log In before entering a new scratch-off code. Returning Customers. Sign in to your account. RadCases is an extensive database of must-know cases covering every radiology subspecialty. Each case includes limited differential diagnoses and clearly annotated images to help you identify key findings at-a-glance. RadCases prepares radiology residents for everything they will see on rounds, rotations, and exams. Practicing radiologists can use RadCases to study for their MOC or to hone their diagnostic skills. RadCases lets you tailor a study regimen that works for you. You can easily locate, group, and review cases by specialty, differential diagnosis, modality, and more for quick and easy comprehension of the most commonly encountered cases. 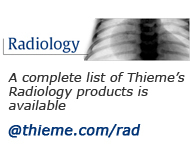 Thieme is proud to work with leading radiologists on the RadCases series. to study and test yourself on more than 250 anatomy illustrations for FREE!